I personally despise corrupt politicians, but I get no pleasure seeing a brother fall, especially one who has good intentions, as I believe the former mayor now council member does. 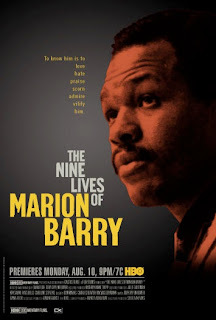 Yet, Marion Barry’s flaws in this HBO video are fascinating to watch. He obviously participated willingly in this film’s production; as misguided his participation may have been. I will assume he saw this merely as a chance of redemption of some kind, since I have no idea what he hoped to achieve. Starting out, Marion Barry was a good-looking man, very charismatic, very popular and a rabble-rouser. Unfortunately, he was also without solid advisors, or a bona fide powerbase: other than the voters. All of the qualities Barry possessed, one could almost guarantee would lead to disaster. His indulgences and perhaps his insecurities - in his words: “I grew up dirt poor” - led Marion Barry to make some very bad calculations, that and his avarice for women and drugs; Grave choices and too many associations with criminals led him into entrapments, arrests and nationwide embarrassments. Check out the title link, to go to HBO-Nine web site.